It is good to review a small chapter in the history of family planning and to remember that family planning has been recognized as a human right for half a century. In addition, I take a look at how a theocracy has had effective control over family size. Family planning was declared to be a basic human right fifty years ago this month. The right to family planning was included in the International Conference on Human Rights held in Tehran, May 1968. The 84 countries attending this Iranian conference agreed to be bound by the decisions, but the world has changed radically since then. For one thing, there are more than double that number of countries. Furthermore, global population has more than doubled from 3,600,000,000 to 7,500,000,000 people. On the good side, there are more, safer and more effective methods of contraception available. The right to family planning is supported by many programs, including FP2020 which works in many developing countries. Planned Parenthood and the federal Title X (ten) program in the USA are under jeopardy because of a proposed law limiting healthcare providers from mentioning the word “abortion”. Unfortunately the right to family planning is being limited or taken away in many countries. Funding for many organizations working internationally has been barred by the Global Gag Rule. The GGR prevents the US from funding any foreign agency that provides abortion services anywhere—or even mentions the word “abortion”. Because of the lack of these services women will go without birth control and there will be millions of unplanned pregnancies, and thousands of women will die from complications of pregnancy—and, ironically, there will be more abortions! The Tehran Proclamation has 9 standards to uphold the human right to family planning. These include non-discrimination, availability of information, accessibility of services and supplies, quality, autonomy of decision making, privacy and confidentiality. I am happy to report my experience has been that these standards are upheld everywhere I have worked. 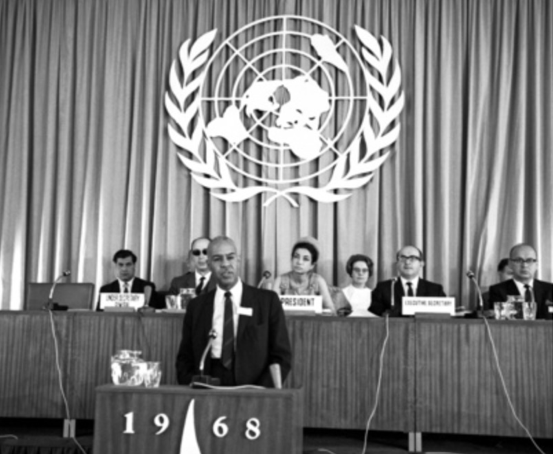 It is difficult to envision a UN conference being held in Iran now—there have been many changes since 1968. The Shah was overthrown in 1979 and the country became an Islamic theocracy, lead by a “Supreme Leader.” A pleasant surprise came about a decade later. The High Judicial Council of Iran decided “family planning does not have any Islamic barrier” so long as abortion was not involved. New laws were passed to promote small families. Couples were required to take birth control classes before they could get a marriage license. Government clinics were set up offering a wide choice of methods, including vasectomy. In addition, the government discouraged childbearing before age 18 and after 35 and recommended that children be spaced 3 or 4 years apart. The family planning program urged couples to have no more than 3 children; government employees lost some of their benefits, such as maternity leave and food coupons, if the family had more than 3 children. The TFR (the average number of children that a woman bears in her lifetime) in Iran had been as high as 7.0, had decreased to 5.5 in 1988 and now is less than replacement at 1.8—the same as the USA. It doesn’t mean that population is shrinking—there are millions of children and teens whose reproductive years are still ahead of them—so it will take decades before the population stabilizes. no more than two children! So be realistic. Without mandatory population control, we are doomed to overshoot and those countries with too many people will suffer the most. There are myriad ways, through policy changes, to put pressure on these countries, such as denying foreign aid to countries where free birth control and abortion are banned. Or elsewhere, REDUCE welfare benefits to families with more than two children, and keep reducing them with each additional child.This sounds harsh, so try the reward system. But to keep promoting free choice and voluntary birth control just postpones the inevitable.